All you need is food. I don’t know how about you guys, but for me, one of the best parts of travelling to another country is going to a nice restaurant and trying out the local cuisine. Taking in the sights and producing fun instastories are all well and good, but sampling new dishes is by far my favourite part of any trip. The way food is prepared and cooked and all the various spices, herbs and ingredients used can tell you quite a lot about a country, its people and their traditions. For quite a long time I used to think that Latvian cuisine was just too plain and simple to be of any note. Potatoes, sauces, meat, a lot of dill, salads, soups, kefir and rye bread are hardly the types of food you usually find in fancy restaurants because they ’re just too simple and don’t exactly look, well… fancy. But then a couple years ago it clicked – food isn’t always only about looks. It’s about the feeling it generates. There is a new Netflix Original series that you may have seen called ”Ugly Delicious” and I think it’s particularly brilliant because of the angle David Chang takes on food. Not every dish has to be pretty. It should be about the taste. And what kind of dishes do we often like best? Those that trigger something inside us. The ones that remind us of something our mum or grandma used to cook for us. It wasn’t until I moved abroad that I understood that Latvian cuisine may be simple, but it is unique and rich in favour. What made me even happier was hearing that my foreign friends and acquaintances that have visited Latvia all loved the local food. All of this gave me the idea of the next article – Foods You Have to Try In Latvia. Let’s go! 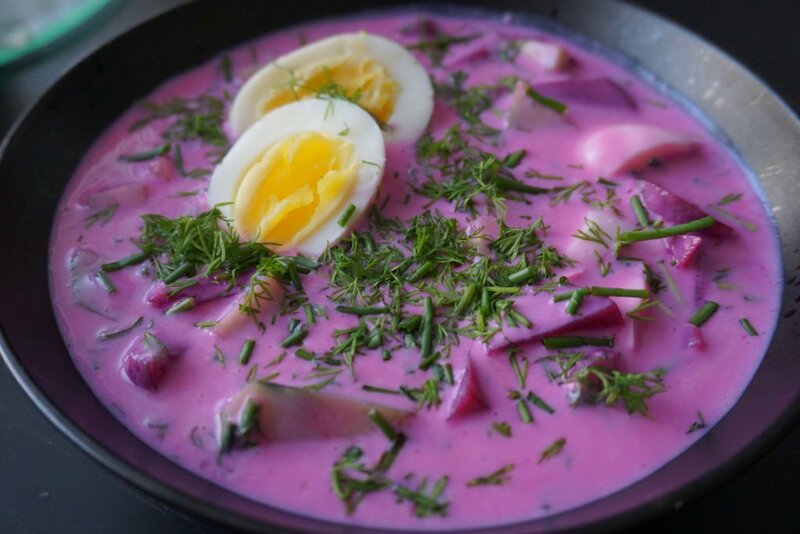 Cold soup (Aukstā zupa) This is an amazing summer dish that Latvians love on a hot summer day. It has virtually no calories, it is refreshing and it is amazingly simple to prepare. Beetroots, cucumbers, dill (Latvians love dill – it grows like grass in our gardens! ), boiled eggs and kefir. And, oh, that colour! Sorrel soup. (Skābeņu zupa) It might look as weird as it sounds, but this is a Latvians staple. 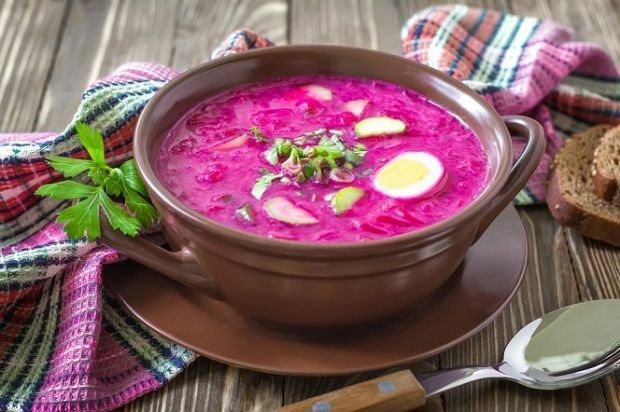 A soup with potatoes, herbs, meat and sorrels served with boiled eggs, this soup has a really special – but very pleasant – sour taste. We also have Brown Pea Soup which is just as good. Or try a Beetroot Soup. Latvians love soups! Pork or chicken chop. (Karbonāde). This is similar to German schnitzel – basically, a breaded chicken or pork fillet covered in egg yolk and fried on a pan. Delicious! 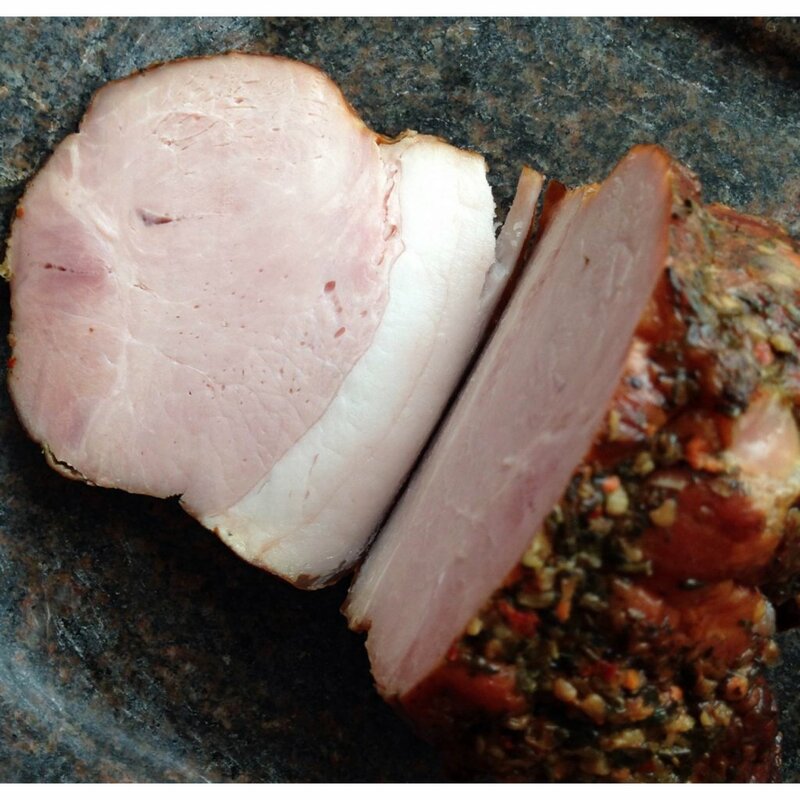 Meat features in most Latvian dishes. Rye Bread (rudzu maize). This bread is hugely popular in Latvia. We don’t really do white bread. Rye bread is especially tasty with a piece of smoked meat. 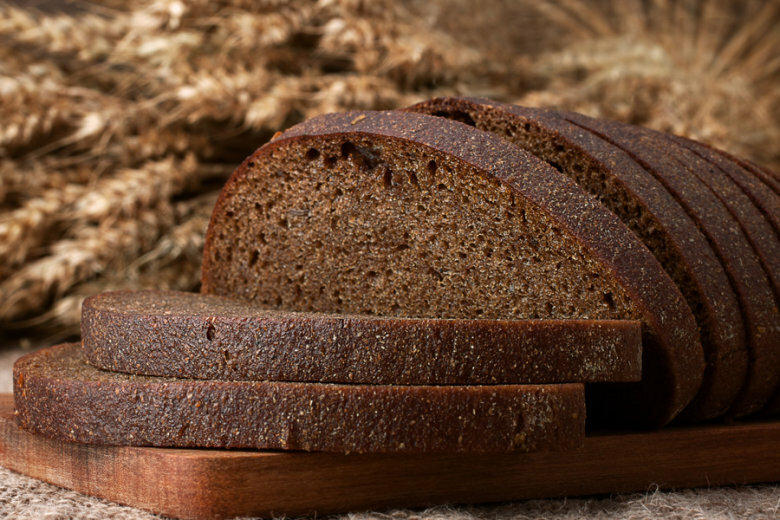 It comes in many different types from really dark ones with seeds to sweet sourdough rye bread – which is my absolute favourite. Smoked bacon, smoked fish and speck (the fat part of a smoked bacon). I think these require no explanation. Rich and fatty, but so good. 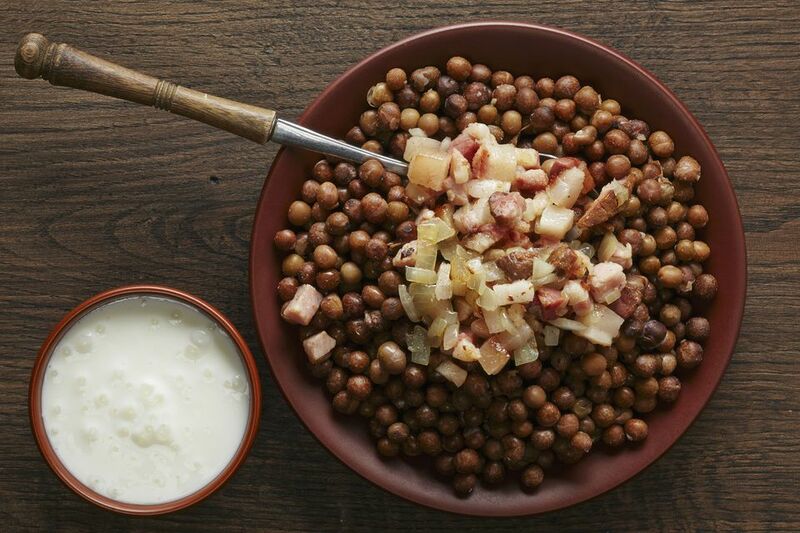 Grey peas and speck. This national dish is one of the traditional Christmas foods as we believe that eating peas brings one luck and money! Potato pancakes with sour cream sauce. Pancakes made from potatoes! Potatoes have always been the most consumed food in Latvia – boiled, fried in a pan, baked in the oven or even in the form of these delicious pancakes. Kvass. A non-alcoholic drink made from rye bread that has a similar taste to beer, but sweeter. Home-made kvass often has a more bitter taste to it. Veselības dzēriens (direct translation: drink of health) Something similar to kvass but even sweeter. My absolute favourite! Riga Black Balsam (Balzāms). This is a magical drink made by 16 different herbs that are local to Latvia. It is believed that the drink has a healing power and Latvians definitely believe that it can cure colds and coughs. Legend has it that Catherine the Great of Russia was healed by this magic drink when she visited Latvia while sick. Journalist Maic Oudejans has written a wonderful story on the drink and found that it ”has been said to inspire politicians like French president Charles De Gaulle and Soviet leader Leonid Brezhnev, while music legends like Led Zeppelin’s Robert Plant and Queen’s Brian May have also endorsed the herbal bitter in more recent years.” Latvian Balsam comes in different flavours – Original, Blackcurrant, Cherry and ‘Element’. There is a lovely bar/shop in Riga Old Town called Riga Black Magic (Kaļķu iela 10) where you can try all of them. And if you really love the taste, you’ll be happy to know that our biggest confectionary brand makes Black Balsam flavoured chocolate candies. Latvian Beer. (Alus) For centuries Latvia has enjoyed a rich beer culture. Beer is, without doubt, our most popular alcoholic drink and even beer aficionados will be surprised by the dizzying range of local beers for sale in big supermarkets like Rimi. We have numerous local breweries producing beloved beers like Valmiermuiža, Madonas, Bauskas, Tērvetes. Curd pie (Biezpiena plātsmaize). 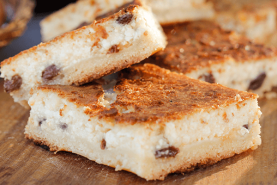 Butter, eggs, flour, sugar, raisins and curd all go into a dish that tastes of Latvian childhood! Latvian Curd Sweet Kārums (Biezpiena sieriņš Kārums) This is something you should definitely try! In a survey conducted 5 years ago, 20% of Latvians said that Karums curd snack was their favourite sweet. You can buy it in any grocery shop. 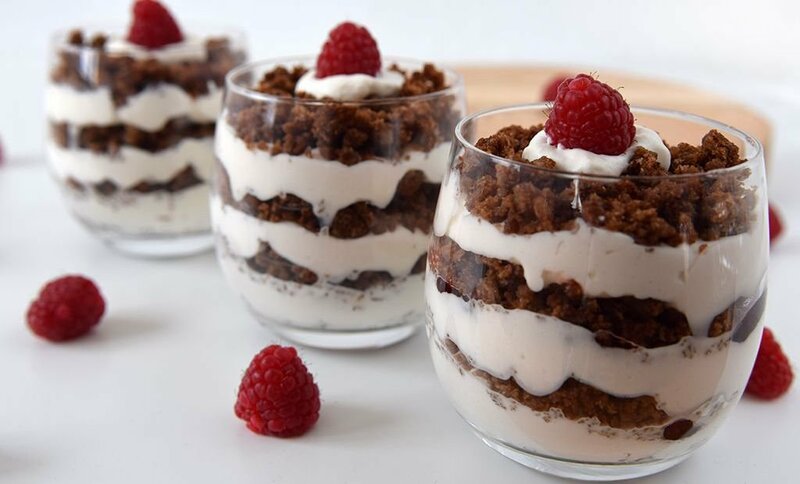 Rye Bread Pudding – This traditional dessert is made from sweetened and dried rye bread, dried apples, cinnamon and raisins along with apricots, plums, cranberries or seasonal berries. All topped with whipped cream. This list is just a small selection but I think it just about covers most of the main traditional dishes and drinks that are unique to Latvia. If there’s anything you’ve tried on your visit to Latvia that you think should be included on this list, please feel free to share it with us in a comment. #1 Folkklubs Ala Pagrabs. Very Latvian pub offering fantastic local cuisine. Simple but delicious. Friends visiting us from New Zealand loved it so much they ate there every single day! #2 Restorāns Riits. Fine seasonal local cuisine and friendly staff. The restaurant’s famous “Melt-in-your-mouth pork ribs” is a real five-star dish. #3 Restaurant 3. A classy, modern northern European-style restaurant that many visitors describe as one of Riga’s must-do experiences.